Finally we’re onto the Color Block Hat. I noticed this pattern when scrolling through the other With Love patterns on the Red Heart website. 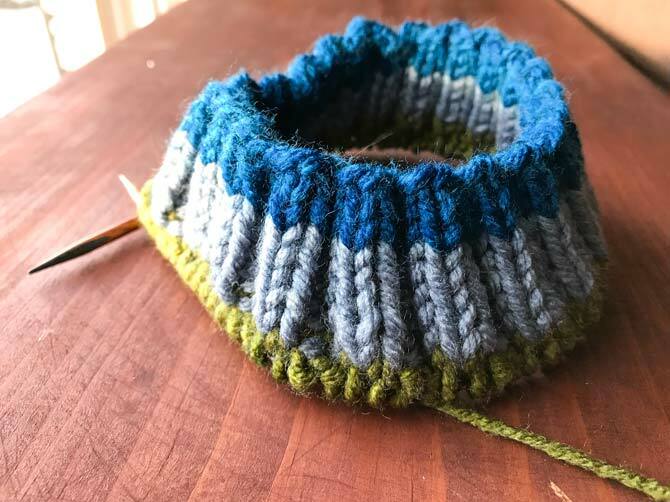 I was looking for something that would lend itself well to being knit with self striping yarn and thought this was the perfect opportunity to show how the colors look when you’re decreasing. The way the colors worked out looks as though it was meant to be. The decreasing was very quick so there was not a long stretch of knitting at a different gauge. 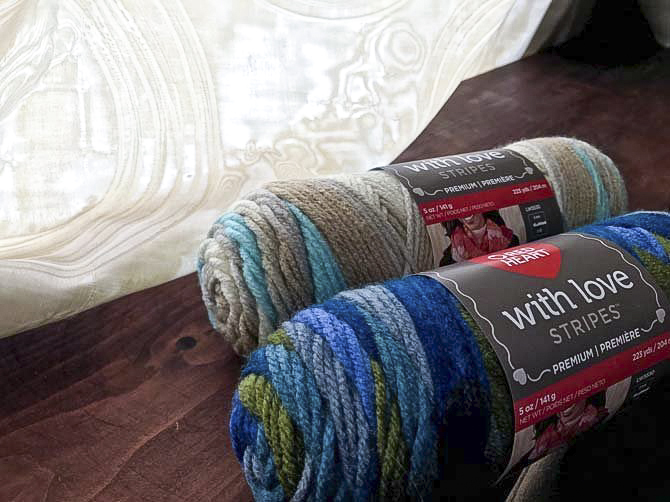 The NEW With Love Stripes yarn takes the guess work out of knitting stripes. As I mentioned in Tuesday’s post, as you decrease and change the circumference of your garment, you’re going to change the nature of your stripes. Since you’re decreasing, the amount of stitches, your stripes will get thicker. Until you just have a solid circle of color at the crown. If this look really bothers you, put a pompom on the top! I really like the neat look of the decreases on the crown of a hat, but not everyone likes the same thing. 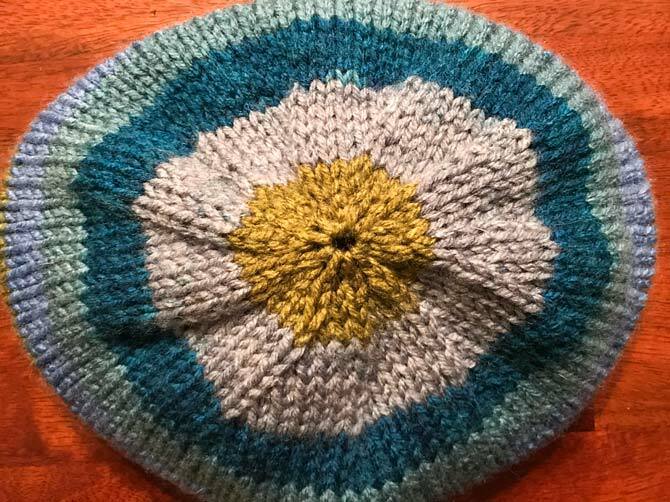 Usually if my finishing is messy, I’ll pop a pompom on the top of a hat, but that just stays between us right? The top of my hat. Here is another angle on the stripes at the top of the hat, and the reason there are so many pompom’s on the hats I make. Another thing you want to be mindful of, when you’re casting on, is the amount of yarn you’re using (if you’re using a long tailed cast on). I know I pulled out a lot of extra yarn to ensure I didn’t run out, as a result, I have a half stripe around the ribbing of the hat. It’s difficult to tell with the ribbing, but I felt like I wasted a lot of yarn and that stripe was not as full as it should have been. The colors starting to form their stripes along the brim of the hat. The ribbing makes the stripe work look subtly different. 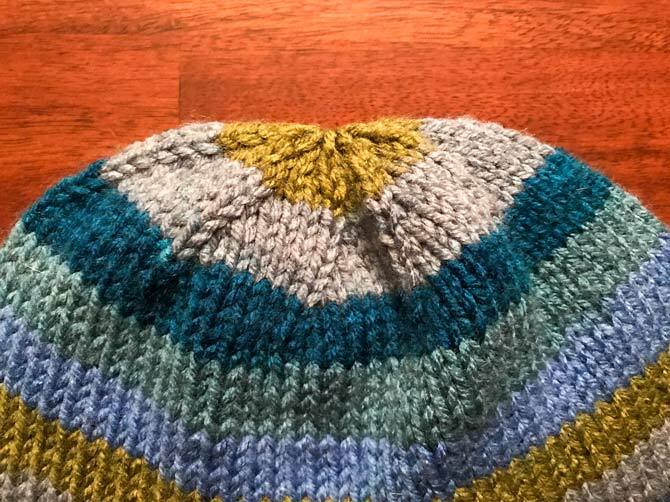 This hat is the perfect pattern to go with self-striping yarn. It’s plain and easy, you just knit in stockinette stitch and the yarn does the work for you. Can you imagine trying to knit this with color work? It would have taken some time to weave in all the ends, switch up yarn, not get it tangled, try to find the color you were just using because it happens to have run off somewhere. Overall it’s just a cleaner and much simpler process. The finished product! 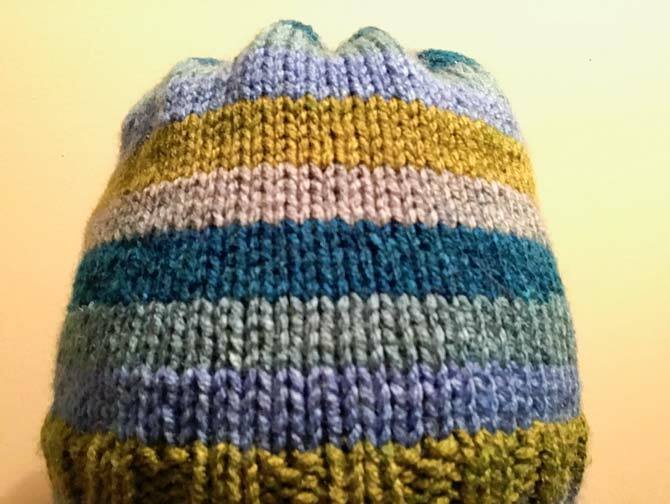 The stripes look great in this hat pattern! Take all the ‘work’ out of ‘color work’ with With Love Stripes. There will be no more fighting multiple balls of yarn or getting everything hopelessly tangled. You can add interest to your knitting without the extra fuss. This is part 4 of 4 in this series. I always have such a difficult time with colour switching. I love that the yarn takes all of the guesswork out of it! As a lover of stripes, I foresee myself finding this brand in the near future. Self-Stripe yarn is so much fun. Also no extra ends with color changes. How cool is that? Makes things so much simpler. Love it. I see such talent when I browse this page. Love Stripes knit up perfectly. definitely giving this yarn a whirl! Your self-striped hat is perfect! Gotta try this. This is such a cute hat, I love the stripes. I’ve been meaning to get back into knitting, and this seems like a great project! I have been making hats with a loom to start. I am working on a hat, it takes a bit to get the hang of it, but it’s coming along nicely. So happy to hear you’re enjoying it!